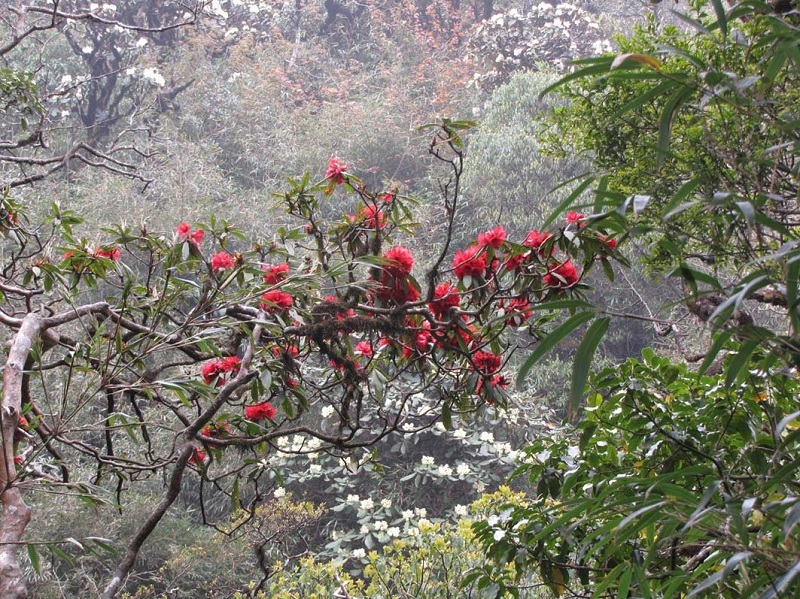 The days in April, on the road "conquered" Mount Fansipan (Sa Pa, Lao Cai), visitors have the opportunity to see the hundreds of years old Do Quyen trees at the height of 2,200 - 3,200m are blooming, adorn the vast forest. Hoang Lien forest is the place where many species of Do Quyen blossom grow in nature. From a height of 2,200m, visitors begin to see the ancient Do Quyen flower. Natural Do Quyen flowers here are diverse in size including the dense clump-like trees grow on cliffs to the trees 20-25cm in diameter, hight to 15-16m. This is also known as the "kingdom" flower of Vietnam's Do Quyen because there are nearly 40 species of flowers Do Quyen bring a variety of colors, flowers bloom every spring. Do Quyen flowers bloom almost year-round, but the season has many species with flowering and also when the flower blooming Do Quyen is best during mid-spring and early summer. This is an indispensable discovery destination of many young visitors every spring. Flowers of 30 species of Do QUyen flowers discovered in the Hoang Lien forest with variety of color and size. The flower size usually ranges from 2 to 15 cm and flowers consist of 5 main colors: yellow, white, pink, red, purple. There are six species of white flowers, seven species of white flowers, five species of white-pink flowers, four species of pink-red flowers, six species of yellow flowers, two species of purple flowers . Have you conquered the "roof of the Indochina" ever? Take this time to confirm yourself, conquer the mountain 3143m high and immersed in the charming beauty of Do Quyen flowers.